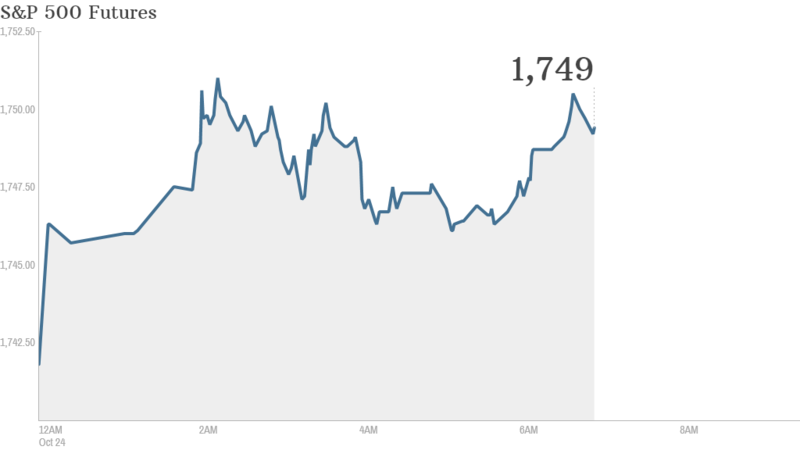 Investors are hoping the latest data from China will help give stocks a boost Thursday. Chinese factory activity hit a 7-month high in October, helping European stocks advance in morning trade. Investors will also get updates on the U.S. economy Thursday, with the government's weekly report on initial jobless claims due at 8:30 a.m. ET, and Census Bureau data on new home sales at 10 a.m. ET. A big day for earnings: Ford (F) shares rallied after the automaker raised guidance and released quarterly earnings and revenue that topped forecasts. On the downside, shares of Symantec (SYMC) got hammered after the company reported earnings and sales that fell short of estimates, and slashed its guidance. Dow Chemical (DOW) shares were also under pressure after the company's earnings fell short. Microsoft (MSFT), Zynga (ZNGA) and Amazon (AMZN) are up in the afternoon. U.S. stocks fell slightly Wednesday, coming off record highs as a dour outlook from Caterpillar (CAT) knocked sentiment. Asian markets ended mixed, with the Nikkei adding 0.4% as corporate earnings rolled in. Rising money market rates in China put a pinch on the Shanghai Composite, which declined 0.9%. Hong Kong's Hang Seng lost 0.7%.